Ludford Mill is a Grade II listed 17th century working water mill, and home, that sits next to a medieval weir on the River Teme at Ludlow, Shropshire. The two-storey, stone rubble, brick and timber frame construction is one of eight corn mills that used to serve Ludlow. Some of the mill machinery has been preserved inside the building and it also houses a modern Archimedes' screw, which provides energy for the local community. The Mill's old gas boiler, which provided heating and hot water, was coming to the end of its useful life. The customer wanted a replacement or an alternative that would take advantage of the electricity generated by the Achimedes' screw in order to reduce environmental impact and save money. He also wanted a flexible system that would enable his family to easily control the heat in different parts of the building at different times. To minimise disruption and changes to the fabric of the historic building, it would be necessary to retain the existing radiator system and the new installation needed to run at a maximum temperature of 60 degrees centigrade. Alterations such as the addition of insulation were not possible, so it was necessary for the system to compensate for high heat loss. Viessmann installation partner, Matrix Energy Systems, was recommended to the customer after he had tried several renewable energy companies, all of which had proposed an air source heat pump. Matrix saw the potential of harvesting a great amount of energy from the water. Following a comprehensive heat loss calculation to determine the fabric efficiency of the property and the temperatures needed to heat it using the existing heating system, the company confirmed that it made good sense to specify a Viessmann ground source heat pump that would efficiently deliver all the heat and hot water comfort required, covering peak heat loss and hot water demand. By taking river water through a screened and filtered inlet to a submersible pump, the water could be fed across a heat exchanger at a much higher temperature than a standard ground source heat pump. This increased temperature would significantly boost the output and efficiency of the ground source heat pump to far above that of a standard ground source system using boreholes or horizontal collectors. Because the building fabric could not be upgraded due its Grade II listing, it was necessary to run the system at a higher temperature to offset heat loss during winter periods. Matrix calculated the flow temperatures necessary around the building; when compared with the flow settings of the boiler already installed, they were a perfect match at 60 degrees centigrade. 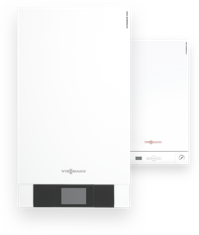 The selected Viessmann Vitocal 350-G 27 kW ground source heat pump can operate at up to 70 degrees centigrade and still be more efficient than a gas boiler thanks to its enhanced vapour injection (EVI) refrigerant circuit. As Ludford Mill only requires a flow temperature of 60 degrees centigrade, coupled with the fact that the system's output is boosted to 34.7 kW due to high input temperatures from the river water, it can operate with a seasonal efficiency as high as 5.5. It also has low noise and vibration emissions, thanks to its sound-optimised design. The Archimedes Screw delivers a maximum of 30 kW electrical power at peak flow and a minimum of 10 kW electrical power at minimum flow. The Vitocal 350-G heat pump never consumes more than 7 kW of electrical power, therefore ensuring this is a truly carbon negative site. The open loop system runs with a seasonal efficiency rating of 5.5. The existing heating controls were upgraded to allow the family more flexibility and control over when they heated their property. With comfort and economy modes, the property can be kept up to temperature at peak demand times and left to dwell at a slightly lower setback temperature when off-peak; this ensures the heat pump operates at maximum efficiency.